Sadia has dedicated her life to advancing human rights in Canada and abroad. She is passionate about the rights of Aboriginal peoples, refugees and religious minorities, food security and access to and protection of water. She is a committed photographer, writer and baker. Born in Sargodha, Pakistan, Sadia draws inspiration from her early exposure to human rights violations. The legacy of her parents’ move to Canada as refugees in 1990 motivated her to pursue a life devoted to social justice. Her parents instilled in their three children a sense of gratitude for the tremendous opportunities Canada provided and the responsibility to contribute to the process of building a more just country and world. Sadia has covered an array of human rights stories. As a participant in the 2006 WUSC International Seminar in Botswana, Sadia witnessed the elderly losing a generation of children to HIV/AIDS and disproportionately assuming the burden of care for orphans and vulnerable children. She returned to the region in 2007 to conduct ethnographic research on the social and cultural impact of HIV/AIDS on grandmothers in the township Katutura, Namibia. The following summer, she presented her perspectives on community-based participatory research at the XVII International AIDS Conference in Mexico City, while volunteering for the UNDP’s Red Ribbon Award. Recognizing the need to bridge her grassroots research with international policy development, Sadia served as Senior Research Analyst and Director of Fundraising for the G8 Research Group. There she assessed G8 compliance with commitments made at the annual G8 Summits; commitments that directly effected communities she had worked with in Southern Africa. She published seventeen reports with particular emphasis on debt relief, energy security, global health and good governance in the context of African development. She also attended G8 Summits in Russia (2006), Germany (2007), and Japan (2008) as an accredited journalist. While studying abroad in Australia, Sadia heard stories of suffering endured by Australia’s Aboriginal and Torres Strait Islander people and the national movement for reconciliation. To deepen her knowledge, she worked at the Australian Human Rights Commission, examining state government policies designed to bridge the gap in life expectancy between Aboriginal Australians and non-Aboriginal Australians. Following that, a series of unique circumstances led her to tour with Iwantja, an Aboriginal rock band through communities in Central Australia. Sadia holds an Honours B.A. in International Relations and Peace and Conflict Studies from the University of Toronto, Trinity College where she was the first William and Nona Heaslip Scholar. A passionate volunteer, she has been an English teacher for at-risk middle school students and worked with young women with physical disabilities. She assisted Dr. Margaret MacMillan with her book Nixon in China: The Week that Changed the World and contributed research to Dr. Robert Bothwell’s Alliance and Illusion: Canada and the World, 1945-1984. Sadia subsequently obtained a Master’s in Human Rights from the University of Sydney where she was a Rotary Ambassadorial Scholar. The Women’s Executive Network featured Sadia, at the age of 22, as one of Canada’s 100 Most Powerful Women. Her work has been recognized by The Toronto Star and the Globe and Mail. Since completing the Sauvé Scholars Program, Sadia has been working for GrantBook, a start-up B corp that helps grantmakers and their networks thrive in the digital era. Her work is primarily in the area of global health, creating and building digital networks for clients such as Grand Challenges Canada and the Bill and Melinda Gates Foundation. 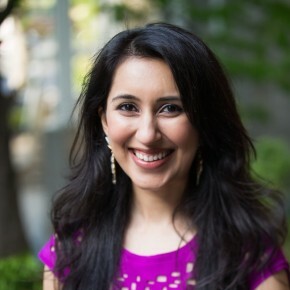 In 2013, she created and oversaw the implementation of The Seva Fellowship, an intensive six-month leadership program for high-potential youth designed to address the catch 22 that youth in Ontario are often caught in—they must first demonstrate experience to enhance their employability for a job that will give them experience. Each fellow led a community initiative, fundraised for their event, received individual mentorship from Sadia at every stage, and participated in leadership workshops. In return, they were given an honorarium to offset a summer job. She also actively built their capacity as youth leaders to influence the policies and programs that impacted their lives. Sadia documented Innu First Nation Elder Elizabeth Penashue’s Wilderness Walk into Labrador’s Mealy Mountains for future generations. The three-week journey—Elizabeth’s last after thirteen years—was an opportunity to spiritually connect to the land, animals and Elizabeth’s birthplace. With Elizabeth’s consent, Sadia shared the experience with the Sauvé community, holding a public presentation and exhibition of the photographs. Sadia considers the visual preservation of traditions such as the Wilderness Walk an integral part of the reconciliation and healing process in Canada. Along with the Sauvé Scholarship, Sadia concurrently completed the 2011/2012 Action Canada Fellowship. As Director of Communications for the Task Force on Inequality, Poverty and the Knowledge-Based Economy, she garnered national media attention for her team’s report Prospering Together: Addressing Inequality and Poverty to Succeed in the Knowledge-Based Economy.